Samsung working on a Dual-SIM Galaxy Note II for China? 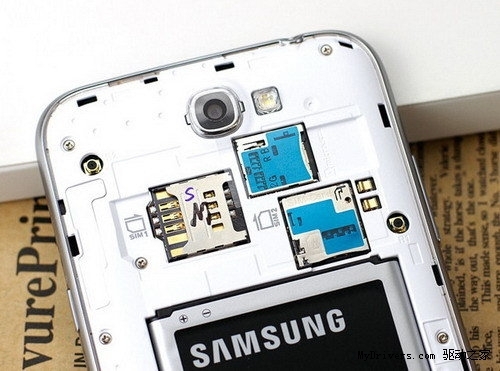 I know that it’s very awkward to hear that Samsung Galaxy Note II having 2 SIM ports inside its tiny body. But that’s what we are seeing in a leak. This specific version of Samsung galaxy Note II will be headed towards China only. According the source, this device is made specifically for China Unicom and has the same specs as the international Note II, with dual-SIM dual standby support. As you can see in the picture below, this Galaxy Note II has 3 card slots. One for microSD, one for normal SIM and one for microSIM. Other specs of the device remain the same – 1.6 GHz Exynos 4412 quad-core CPU, 2 GB of RAM, 5.5” 720x1280px display, S-Pen, Android 4.1 Jelly Bean and other goodies.